As your child turns into a teenager, your parenting role is likely to shift. You may find yourself becoming more of a guide, rather than an enforcer. That’s not to say your child won’t need you to intervene when there are safety issues or that your teen won’t need consequences. But, by now, it’s OK to let your child make some choices on his own, even when you think it’s a bad choice. Teens like to test the limits of their independence. So don’t be surprised when your teen argues when you say no or when she goes behind your back to do as she pleases. There’s often a tug-of-war between parents and teens. Your child may demand your assistance one minute and claim she doesn’t need you the next. Adolescence can be a tumultuous time for teens as they change physically, emotionally, and socially. It’s normal for teens to act responsible and almost adult-like in some areas of their lives, while still holding onto their child-like ways in other areas. As friends and romantic relationships grow increasingly important, your teen will want to spend more time with his peers. That means less interest in family time. Your teen will also want more privacy. She may want to keep her social media conversations private and she may spend a lot more time in her room with the door closed. That can all be part of normal growing up. It’s important, however, to keep an eye out for mental health issues. Depression, anxiety, eating disorders, and substance abuse issues may emerge during the teenage years. By now, you only have a few years left to prepare your teen for the real world. And it can be tricky to strike a balance that gives your child enough freedom, while still giving him plenty of guidance. Most teens want more freedom than they can handle. They may insist they need a later curfew or they may try to debate when you’ve said no about a party. Talking back is common as your teen will go through phases where he insists he knows everything and you know nothing about what it’s like to be a teenager. Your teen may also assert his independence by insisting he do things at his own pace. When you tell him to mow the lawn or help with dishes, he’s likely to complain or tell you that he’ll do it later. Your teen may have a short temper and he may become distraught over relationship troubles, friend issues, and school-related problems. It’s common for teens to lie in an attempt to get out of trouble. Your teen may deny breaking the rules or claim he has no idea how the dent got in the car. Your teen may experiment with different personas too. She may be into classical musical one week and heavy metal the next. Or, she may change the way she dresses or wears her hair as she looks for new ways to express herself. Just because your teen has outgrown time-out (most of them would actually be happy if they got sent to their rooms), doesn’t mean you can’t instill effective consequences. But it’s important to find consequences that will teach life lessons. Remove electronics—From smartphones to laptops, screen time is important to most teenagers. Restricting your teen’s phone privileges can be an effective consequence. Just make sure it’s time-limited. Usually, 24 hours is long enough to send a clear message to your teen. Take away time with friends—If your teen’s misbehavior involves friends, take away her right to see her pals for a while. Ground her for a few days or cancel her special weekend plans. A break from her buddies may remind her to make a better choice next time. Tighten the rules—If your teen violates the rules, he may be showing you he can’t handle the freedom you’re giving him. Tighten the rules by giving him an earlier curfew or by reducing the amount of time he spends using his electronics. Have your teen perform an act of restitution—If your teenager’s behavior hurts someone else, create a plan to make amends. Fixing something he broke or doing an extra chore for someone may help repair the relationship and remind him to accept responsibility for his behavior. Allow your teen to face natural consequences—Natural consequences can be the best teachers in certain situations. But it’s important to make sure the natural consequences will really teach your teen a life lesson. If so, back off and let your teen face the consequences for his choices. Provide logical consequences—If your teen breaks something, make him pay to fix it. Or, if he is irresponsible with the car, take away his driving privileges. Create consequences that are directly tied to the poor choices your teen made. Assign extra responsibilities—Take away your teen’s privileges until he completes extra chores or performs certain tasks. When he shows you he can be responsible, he can earn his privileges back. Behave like an overprotective helicopter parent and your teenager won’t learn how to make healthy decisions. If you’re too permissive, however, he won’t gain the skills he needs to become a responsible adult. Avoid power struggles—When your teen says, “That’s not fair!” or “I’ll do it later,” resist the temptation to argue. Set a firm limit and follow through with a consequence. But don’t get sucked into a heated power struggle. Make your expectations clear—Before you drop your teen off at the movies or you let her walk to the skate park alone, make your expectations clear. Tell her what you want her to do if she encounters a problem and what time you expect her to be home. Let your teen earn privileges—Whether your teen wants expensive basketball sneakers, or he asks to have a later bedtime, make it clear that privileges must be earned. If your teen’s behavior doesn’t warrant privileges, don’t allow him to have them. Be a good role model—Your teen learns more by watching what you do, rather than hearing what you say. So make sure you’re being a good role model in all areas of your teen’s life. Spend quality time together—Give your teen positive attention to build a solid foundation for your relationship. Be willing to step into your teen’s world by learning how to play a video game or by watching a teen movie. Expect your teen to be responsible—Your teen will likely live up to your expectations, as long as those expectations are reasonable. So make it clear that you expect her to do well in school or that you expect her to get her chores done every day. 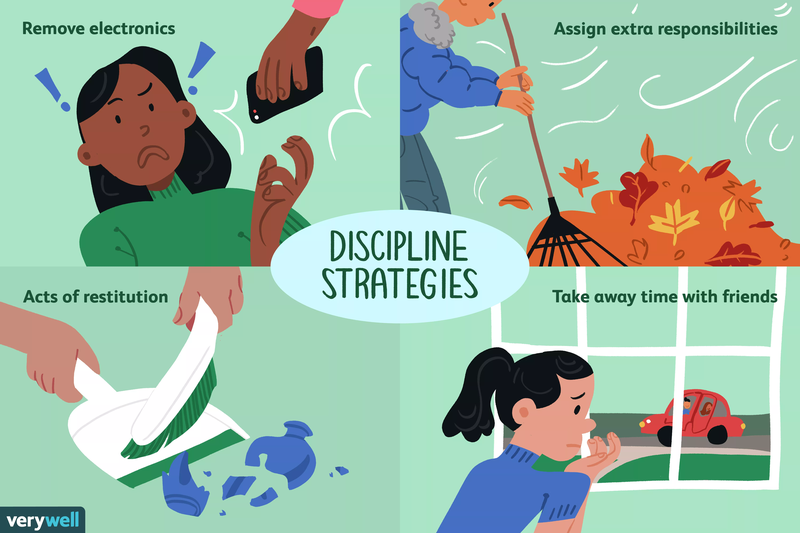 Don’t reserve discipline for serious rule violations—If your 16-year-oldsits in his room and plays video games all day, he may not be misbehaving. But, he might still need some discipline to help him socialize and behave more responsibly. Provide discipline that helps your child do better, not just punishment for wrongdoing. You might find your teen can’t stop talking to her friends. But the minute you ask her how her day was, she might have nothing to say. Communicate regularly—Healthy communication is at the heart of any good relationship. It’s important to talk about everything from peer pressure to her goals for the future. When your teen knows she can talk to you, she’ll be more likely to seek your guidance. Talk during an activity—Insisting your teen sit down and talk to you face-to-face about serious subjects may cause your teen to shut down. You might find your teen is more willing to talk when you’re doing an activity together, such as playing catch or even riding in the car. Don’t insist your teen talk to you—It’s healthy for your teen to gain some independence so don’t insist that he tell you everything. Help him identify several other healthy adults she could always turn to for advice. An aunt, grandmother, coach, teacher, or neighbor might be the types of people your child feels comfortable talking to about certain subjects. Problem-solve together—Rather than tell your teen how to do things better, invite her to problem-solve with you. Ask questions like, “What could you do that would help you remember to do your chores?” Brainstorm ideas together and then encourage your teen to pick a potential solution. Step into your teen’s world—Your teen may communicate more freely over social media or through text message. So be willing to step into your teen’s world and talk to her in whatever form she seems most comfortable opening up in. now a days. we need to support, protect our child to reach their dreams and goal.